In the last weeks, both Airbus and Boeing have released the figures of aircraft deliveries for the complete 2017. This is just a quick post to update a graphic with the commercial wide-body airplanes’ deliveries per year since 1969 (year of the introduction of the 747) till 2017 (1). Commercial wide-body airplanes’ deliveries per year, 1969-2017. For the first time ever, in 2015 over 400 twin-aisle aircraft were delivered in a year (412), the same feat was achieved in 2016 (402). In 2017 production descended to 394 twin-aisles, still the third best year in wide-body history. The average number of deliveries for the previous 20-year period (1997-2016) was 239 airplanes per year. 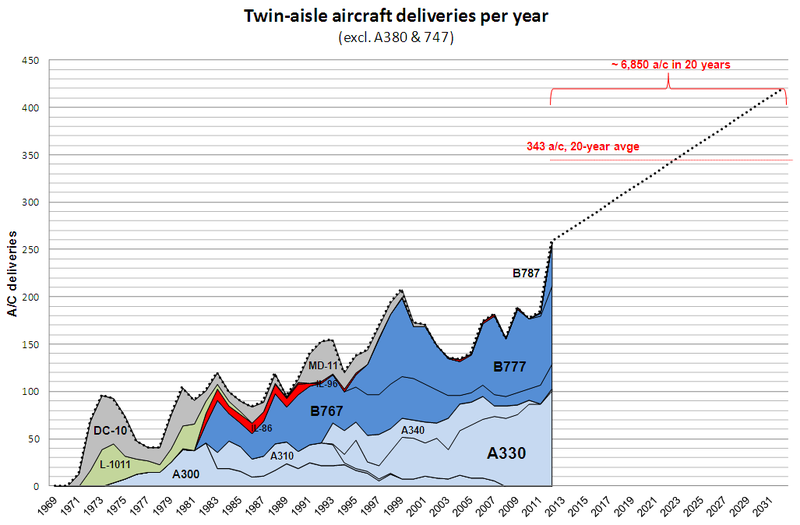 Up to now, in the 49 years of twin-aisle market, in only 6 years more than 300 airplanes were delivered in a single year, the six last years, and only in other 9 years more than 200 airplanes had been delivered. The combined steep production ramp-up during last years has enabled to reach a production rate of more than the double of what was produced in 2010. In particular, the combined compound annual growth rate (CAGR) of the rate of deliveries for the last 10 years has been 7.1%. These rates are above the yearly growth of traffic (measured in RPKs). With the figures up to the end of 2017, nearly 8,800 wide-body airplanes had been delivered. Thus, by mid-2018, we will certainly reach the 9,000th. However, we won’t know whether the 9,000th twin aisle will be a Boeing or an Airbus. The share of wide-body deliveries in 2017: 59% Boeing and 41% Airbus. There were 136 787s delivered in 2017. A remarkable feat: one aircraft short of its 2016 record of 137 deliveries, the largest amount of twin-aisle deliveries of a single model in a single year ever. Only the 787 and the A330 have ever been delivered in excess of 100 aircraft in any given year (4 times for each aircraft). (1) See here a previous post with the figures up to 2015.